It’s simple, this tail pad is the business, not only does it work as a tail pad should, but it’s legit when it comes to being an eco and sustainable product. It’s well designed, looks proper cool and feels solid. I’m putting ecoPro up there as one of the my top three surf accessories of 2017/8. So this review writes itself, it’s a no brainier, for your next pad I highly recommend one of these. After checking out the website and then the second I held the pad in my hands, I knew this was a company and product that I could get behind for a few reasons. Then I got to test the pad and I’m fully convinced. I’m backing this product and so are those that I’ve introduced to on my travels. A perfect little peak for the first test run. The race is on for the surf industry to grab our attention with pumping out so called eco and sustainable products. There’s a lot of fancy jargon and claims that certain products meet the standards of calling themselves planet friendly. For example, I came across a tail traction pad claiming to be cork, no mention of other ingredients on the package. I was excited to take a look….it turns out the pad did contain cork, apparently about 0.08%!! The rest was made up of EVA composite, which isn’t indicated and no sight of what the composite includes. The idea and enervation should be commended for sure, it’s a step in the right direction, but I did feel it was a little misleading and it could be done better. You might argue that it maybe not be possible to produce a traction pad made 100% out of cork, well, the guys at ecoPro have gone and nailed it! Adding some style to the caboose of this stick. Cork never looked so good. Why Cork? It’s 100% natural, elastic, impermeable, lightweight, biodegradable, reusable and recyclable ... a no brainier! If you want some facts on the cork process, check out the details here. So lets not mince words people and get into it. 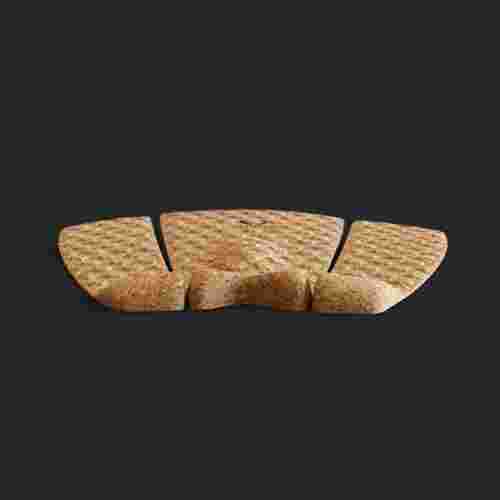 It’s a tail traction pad for your surfboard and it’s made from 100% certified cork, it’s that simple. The cork gear is legitimate and receives the certified stamp from APCOR. Clean lines all the way. It's 100% cork and thats it. Super Simple and it looks great. If you’re new to the surf world, a traction pad is deigned to be stuck to the tail of your board. It helps stop your foot sliding off the tail, which is an area of the board surfers apply a lot of pressure when carrying out manoeuvres and aerials. The box my deck pad came in was recycled card board and looked proper smart. Then I opened it. The cork pad simply looks beautiful! A work of art, even before you stick it to the board. You know that feeling when you spot a beautifully crafted piece of wood and you find yourself drawn to it to run your hand along it’s surface to feel the texture? I got the same thing with these pads. At first touch, I was worried it might be a little tough or harsh on the foot, I shouldn’t have worried, it wasn’t an issue. Nic, searching Cornwall for another test location. I know looks shouldn’t be an issue, although the pad is beautiful to look at, I wasn’t actually sure it would look that great on my board... again, I shouldn’t have bothered worrying, it’s styling and I’ve had a few people stop to admire the look. I reckon these would look really good on some old skool boards. The guys hail from Portugal, where there is an abundance of cork production. The brand doesn’t claim to be something it’s not and they don’t mess around with fancy jargon and statements claiming to be the next best thing. They keep it simple and honestly let the product do the talking, which I’m a huge fan of. The best of all worlds eco. A Notox surfboard with ecoPro 100% cork deck pad. The website is no messing either, straight to the point with no rabbit hole traps to lead you down a shopping garden path you never intended getting lost on. They don’t even have this whole speech about themselves and stating surfing products by surfers that have surfed the globe, blah blah blah. The only self proclaimed statement they make ‘ecoPro-driven by nature’, pure and simple, just like their products. Testing got done in Spain, Portugal and the UK, mostly wearing booties during surf sessions. From head high to knee high. This was done other a period of 2 months. Nic finding some 'Cornish Gold' for some back side testing. I must add, I’ve only used the ecoPro for 2 months, so durability hasn’t been tested over a long period. That said, the gear feels and looks solid, so I’m not worried that it won’t last the test of time. Yes, no hesitation, it does exactly what it’s meant to. The product comes in a sweet little recycled package. Now I’m not saying it’s function as a pad is any better or superior than other pads on the market, even the 0.08% cork pad. I know a tail pad is just that and most wouldn’t take a second thought on the subject, I know I didn’t till recently. But where this pad excels is that it really is an eco and sustainable product, a smarter purchase in the direction of doing our part for mother earth. Wood and cork getting together. Looking good. Down the line and setting up for the 'air' that may or may not have gone wrong. Cost is correct I think at 45euro, at the top end scale of price….but worth every penny. I seriously can’t find any cons with this accessory. I fired a few questions to the team at ecoPro for you to get a feel of the direction they came from and are where they are going. SB: Can you give us a little intro into who you are and where you come from? Ruben: I was born in the Azores Islands and I started to surfing at 13 years old. Later on I moved to the mainland in order to study Design at Fine Arts Oporto University. This was where I discover my great passion for Experimental Design, which moved me to work as an Artist for a couple of years and create some pieces on Video, Sound and Installations. Life, Art and Science is still my actual statement. 100% natural, 100% cork and it works very welll indeed. What's stopping this being your next deck grip? Despite all that I have achieved in art and of which I am very proud, I had a broken “art" and I founded Bewater Adapt Studio, a full service design agency: from branding to advertising, print, packaging, digital. This was where I started to work with cork and that led me to develop the ecoPro project. Ruben: It was the contact with cork in a project as a designer that made me get to know how amazing and versatile this material is. As a surfer I had this click! I would challenge myself to build a Cork Traction Pad! SB: Do you source all your cork locally? Ruben: Yes. The numbers show the vitality and importance of the cork industry in Portugal. 34% of the world’s area of cork oak forest is located in Portugal, representing 736,000 hectares of a total of 2,139,942 hectares. The left that kept on giving. Somewhere in Cornwall. SB: A question that is often asked of such products: how was the product made? Is the production eco and sustainable? Are their area’s you are looking to improve and how? Ruben: Cork itself and all industrial paths are incredibly sustainable. In our website you will find some of the benefits of this material. In cork process nothing is lost, everything is transformed. For the time being, each pad in line production needs 4 days to be completed. Starting by layering the cork, machining in cnc, engraving by laser, manual finishing, cork treatment, applying the adhesive and packing. Our dream is that one day we will have a super advanced production unit run entirely on renewable energy. Meanwhile we are always trying to improve production processes having in mind sustainability. To get to know more about all cork benefits, check this website. SB:To bind the cork, what binder do you use and is it eco? Ruben: Our suppliers uses Polyurethane, the cork agglomerate is around 97% Cork to 3% of binder. The industry is also continuously innovating to produce a more sustainable material. SB:What is the glue you use for sticking the pad the board? Is it eco? If not, are you researching an eco alternative and how close do you think you are to achieving this? Ruben: We are using 3M from Europe. We believe that initiatives like ours will enforce these tendency to move all the industries forward to benefit our planet resources and its inhabitants. SB: Did you encounter any challenges whilst making this product a reality? How did you over come them? Ruben: LOL, it is a long, long journey…The big challenge was to develop a functional deck which consists almost entirely of natural materials, having the right combination between traction, comfort and durability. To follow through with an idea and turn it into a reality it takes a big level of patience, dedication and great amount of resilience. This is what helped me dealing with the unknown and with an ocean of emotions and allowed me to bring forward the cork traction pad. SB: Do you have future products in the making that you might be able to share with us? Ruben: We are already preparing new models and continuing the research of materials and new ways of doing things. We are planning to launch a new model to fit on FISH TAIL and we have some other areas where we know we can make a difference too. But, one step at a time and always both of them on mother Earth! Thank you Ruben for your open and honest answers. We at Surf Bunker will be eagerly watching your progress and success. In all it's glory the ecoPro deck pad. The ecopro cork deck grip actuallly enhances your board. Clean and simple.